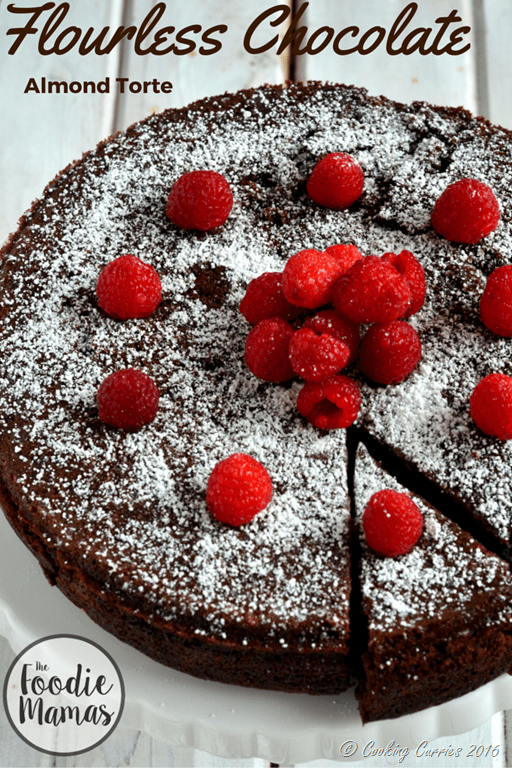 This gluten free chocolate decadence is something you just have to make this Valentine’s Day! This Valentine’s day, I share with you a recipe that is very special to my heart. This Flourless Chocolate Almond Torte was a last minute decision, the very first time I made it. AJ was away to Beijing for work for a week and was coming back home. I wanted to make something special but deciding on something was not so easy alongside managing a 5 month old baby. I procrastinated the decision making and when it was finally that day, I picked up this really old cookbook with chocolate recipes in it. It was one of those books with no author to it and just had a collection of chocolate cakes and cookies and other recipes. I dont even know where I bought it from. So, anyways, I picked up this book and was going through it, desperately trying to get some inspiration and thats when I saw this chocolate almond torte. It looked pretty. The time taken to bake it was something I could manage. I ran through the ingredient list and I had everything I needed. I proceeded to bake. That is when I saw that this barely had any flour in it. Just 3 tablespoon of all purpose flour. 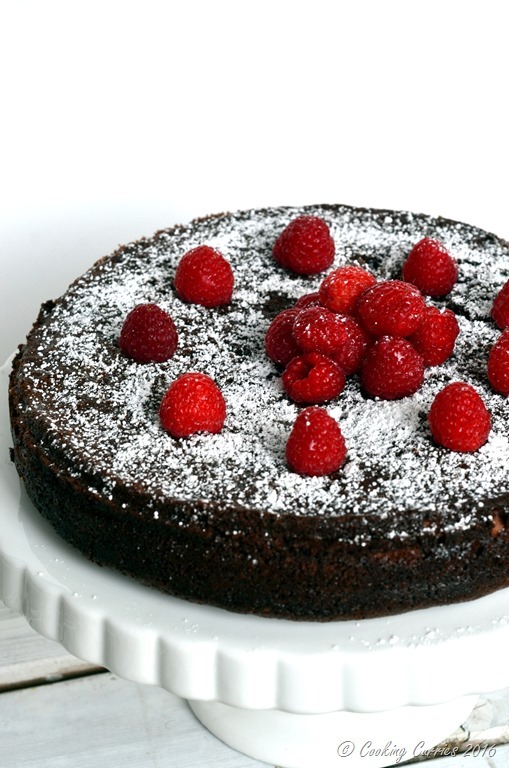 Its a torte, I know, but still I had never baked with that less flour and I was pretty sure that I was gonna spend some wasteful time trying make something that is only going to be a huge disaster. I continued. Mixed up everything and poured it into the pan and set it to bake! When the oven beeped, I checked to see if it was done, it seemed to need a couple more minutes of baking. So I let it do its thing. The oven beeped again and it was done. I took it out. It looked alright. Flash forward a few hours. AJ was home, everyone was happy, we all ate lunch and then I served this for dessert. And OMG! was it the best thing ever or what? It was the moistest chocolate cake of sorts, yet not really a cake, it was a little dense but not in a bad way. I couldnt express myself. AJ was completely blown over and I had to try hard to convince him to save some for later. A couple of years in and it was AJs birthday. I asked him what kinda cake he wanted me to bake. It is mostly a chocolate cake – well, its always been a chocolate cake. But I try to do some variations with it. And he asked me to make this. I amde it, we had a few friends over to celebrate and everyone loved it. The cake, literally vanished in seconds. And now this is the third time I am making this and I decided to try and eliminate that little bit of flour the original recipe required and substitute with more of the almond meal that I was already using in the recipe. It turned out to be not bad at all. I could not even tell the difference. The almond in it gives it a nice nutty flavor to complement the chocolate. And, do I have to tell you how gorgeous it looks?! Preheat the oven to 350F. Grease a spring form pan with cooking spray and keep aside. Melt the chocolate with the water over medium heat, add the brown sugar and let it melt. Stir along. Add the butter about 2 tbsp at a time and let it melt into the chocolate mixture. Add the vanilla extract. Mix well. Remove the pan from the heat and add the almond meal to it, whisk well to incorporate. Add the egg yolks one by one, mixing it well. Beat the egg whites in a stand mixer to form soft peaks. Gently fold this into the chocolate mixture. Stir in the almonds. Pour into the pan, tap the sides to let it settle and bake for 45 mins or so. Cool in the pan for about 30 mins and transfer to a serving plate / cake stand and garnish with powderd sugar and fruits of your choice. This fool proof copycat version of Starbucks White Chocolate Cranberry Bliss Bar by Sabrina of Dinner then Dessert. This Double Chocolate Skinny Baked Donuts indulgence from Chrissie of The Busy Baker is something you can eat with a little less guilt. The little chocolate bites are filled with an awesome surprise of fondant inside them! Recipe by Deepika of Easy Baby Meals. 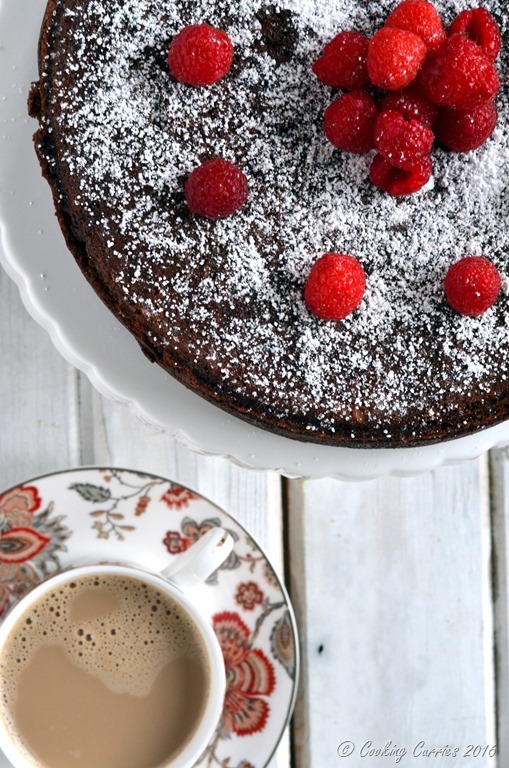 This chocolate torte looks delicious and do decadent, I can’t think of a nicer way to spend with this on Valentine’s Day! 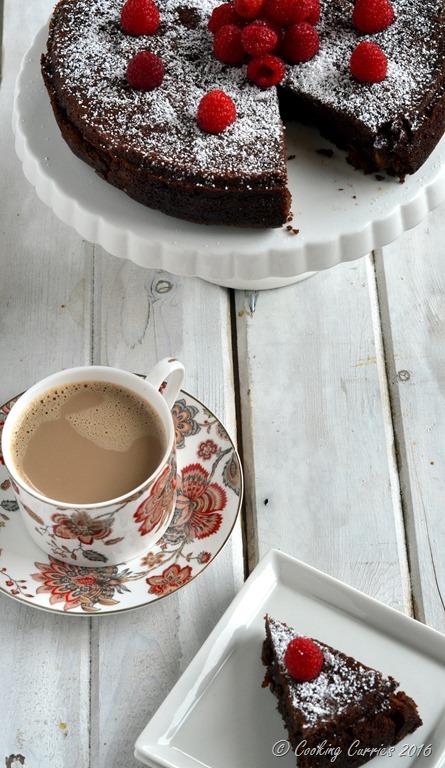 A slice of this and a cup of coffee sounds like heaven! I love that it’s flourless too – you’d never know! I could go for a slice (or three) of this right now! I love chocolate and almond! this looks divine! I’ll have a slice, please! Flourless? Wow this looks too good to be true! I will have to make this soon! I love that this is flourless. 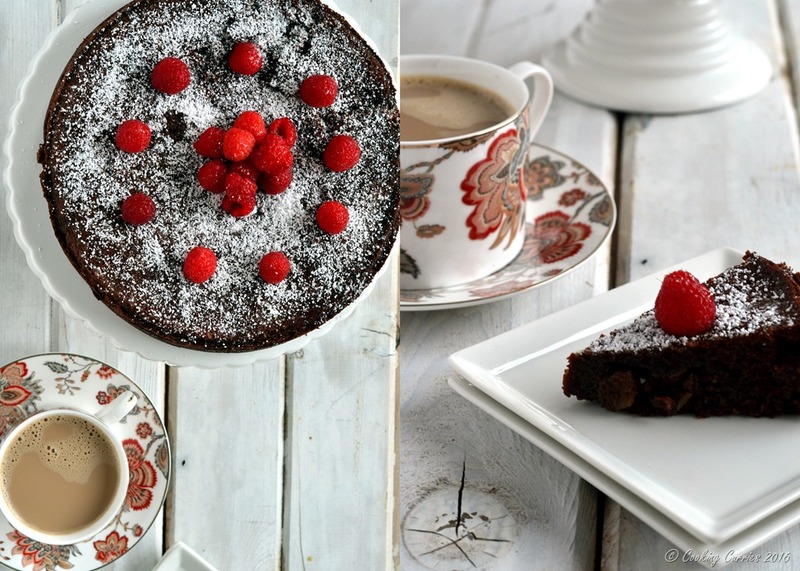 A great combination with the chocolate and raspberries. A very sumptuous looking cake. WOW, this looks fantastic!! The raspberries really make it pop.